Leigh Podgorski is an award winning playwright and screenwriter. Among her favorite projects are a play and documentary on Cahuilla elder Katherine Siva Saubel entitled We Are Still Here and the one-act play Windstorm for which she interviewed Dr. Elisabeth Kubler Ross. Leigh’s novels include The Women Debrowska that is loosely based on her own Polish ancestry, Ouray’s Peak which follows the story of one matriarchal Ute Indian lineage, and the Mystic Mystery Stone Quest series that includes Desert Chimera, Gallows Ascending, and the newly released Neuri Shape-Shifter. Her most recent novel is Western Song, which has is a Bronze Medalist Winner in the Readers’ Favorite Book Award Contest and published by Solstice Publishing. Solstice has also published novellas My Soul to Take and The Season of the Neuri Knight as well as her short story Silent Night. Currently she is has just completed work on a murder mystery adapted from her play, Amara. Western Song is a contemporary romance novel written by Leigh Podgorski. None of his closest friends had the slightest idea that Cody Goode was actually saving up to get married and had a bride travelling to meet him from across the world. Cody had been Weston Beaudurant’s best friend ever since their school days together, and Wes couldn’t help but blame himself for Cody’s death. Wes had ended up getting Baby Face as his bull in the Chesholm Brothers Rodeo, and anyone who knew anything hadn’t placed any bets on Wes winning over that ornery bull. Wes, as expected, only lasted a few seconds before landing hard on the packed dirt. Cody, dressed in his rodeo clown garb, was the first one out there to distract the angered bull. He had done this dozens of times before, but Baby Face was a different matter altogether. The angry bull rushed at Cody and tossed him in the air. Wes was horrified at seeing Cody’s lifeless body lying on the ground. When Wes and his friends opened Cody’s strongbox after his funeral, they couldn’t decide which was more surprising: the over $25 thousand dollars it contained or the fact that Cody’s bride was arriving that day by rail. 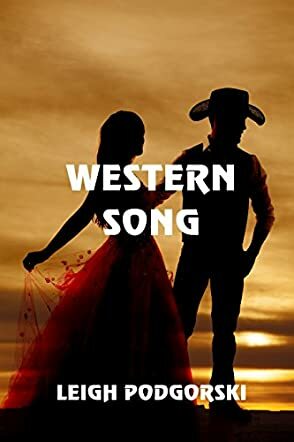 Leigh Podgorski’s contemporary romance novel, Western Song, is a sweet and moving romantic tale about a Thai mail-order bride and the taciturn bachelor rancher who gives her a home in honor of his dead friend. The author does a fabulous job of making her characters feel real and authentic, especially Wes and Song. Her plot keeps the tension between the two of them humming as Song adapts to her new culture and finds her purpose in life, and Wes deals with the guilt he feels over Cody’s death. I was particularly entranced by Podgorski’s nature descriptions and the way she made the Wild River area of Wyoming come to life so vividly. I loved seeing the seasons change and following Wes and the others as they work in and with their environment. And while Wyoming’s winters seemed harsh indeed, I finished the book having an enhanced appreciation for an outstanding natural environment in that state. Western Song is much more than a romance; it’s a modern day love story about Wyoming and the modern frontier. It’s most highly recommended.